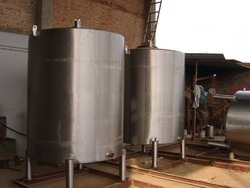 We offer Milk Storage Tanks. We are a reputed entity, engaged in offering a qualitative array of Milk Silo. Our Vertical Milk Silos used in outdoor storage of Chilled Milk withstand all weather conditions for longer durations consistently. 15, 000 Liters to 1, 00, 000 Liters. We have trusted names in the industry in offering a wide range of Milk Silos. 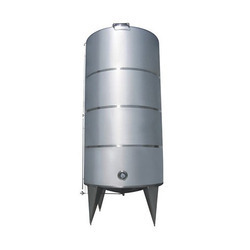 Offered silos can be made available in bulk quantities. - The milk is pre-cooled before entering the silo via a no return valve at the bottom of the tank. - A durable exterior together with high density insulation protects from extreme temperature. Two layer – Inner 2.5mm SS 304, Outer 2mm SS304 with puff insulation with in and out way connection for circulation, gear motor with agitator. Addons: outlet union, adjustable three leg mount and thermowell.